A Starbucks partner sent me a pic of a reusable straws and an idea to go with it: What do you think of an idea of a reusable straw discount at Starbucks? The idea is this: If you bring in your own straw to Starbucks, you get a discount on your cold beverage. I like the idea in combination with the current cup discount. Starbucks could give you 5 cents off for a reusable straw and 10 cents off for your own cup. If you bring in your own reusable cold cup, including the straw, you would get 15 cents off of your cold beverage purchase. It’s an idea that could potentially reduce straw use. Starbucks has announced that they are moving to all compostable straws in their stores, but this isn’t a perfect solution. In cities like Seattle, where industrial composting is the norm, the Starbucks compostable straws can be tossed into compost bins and they’ll be composted with traditional organic compostable items. However, it will absolutely be the case that most of those compostable straws will still end up in land fills. It’s silly to think that 100% of all customers will manage to toss their compostable straws into the compost bins (many will land in the garbage), and in cities where city curbside composting is non-existent, the straws will necessarily go into garbage, and ultimately landfill waste. It’s true that compostable straws are an improvement over the previous plastic straws, but it’s not perfect. Using a flat plastic lid with your cold drink gives a the customer a weightier plastic lid: This can easily be tossed into a recycle bin. Still, reusable cold or hot ware, (and for-here ware) are far more earth-friendly solutions. 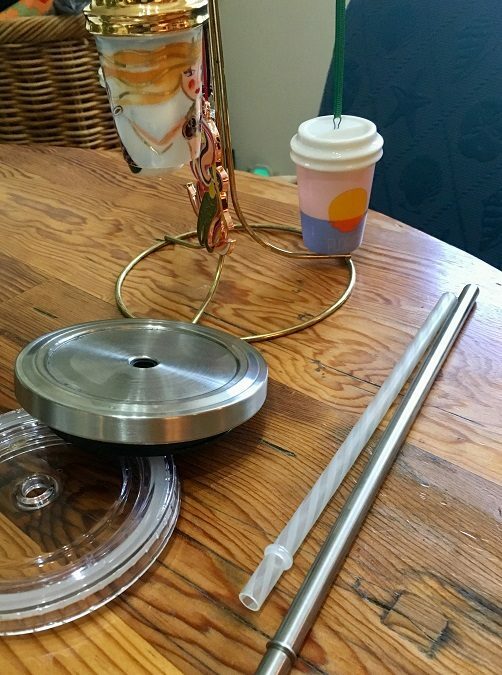 Actually, maybe there’s a good argument that it’s time to raise the cup discount: Starbucks could consider offering 15 cents cup discount for your own cup, and 5 cents for a reusable straw. A customer ordering a cold beverage would then get 20 cents off of his or her cold beverage purchase. (H/t – Thank you Aymee for the pic and idea! You can find StarbucksMelody on twitter, for Starbucks updates, news, information, and few non-Starbuckian tweets.) Reminder, if you want to see more photos that customers submit to this site, visit StarbucksMoments.com. Starbucks partners are helping to raise money for a library in Ethiopia. Yes !! And the discount for bringing your own cup should be much greater than .10. They need to add into the Starbucks reward additional stars for bringing your reusable items. I think these are both (raising the cup discount and instituting a straw discount) great ideas! 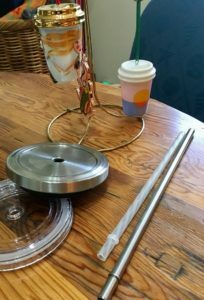 Maybe Starbucks could start selling the reusable straws, too. Anything to encourage people! They do sell some reusable straws here in the Chicsgo area. Your addition of $.15 for both is excellent! More so for customers with Trenta Plastic cups with straws. It would also be cost efficient for us, due to the cost of our Trenta plastic cup., It’s a win win! I’m not sure if is still available, but we sold a pack of 3 reusable plastic green straws. You can find them on Ebay. Great idea, since my reusable cup always has its reusable lid and straw. And, Starbucks does sell reusable straws. A 20 cent discount would work. The ten cent discount is merely a token to say they offer it. If they really want to encourage customers to do it, they need to raise it to at least 25 cents. I like the straw discount idea as well. Maybe that could be ten cents and the cups 25 cents. Still only adds up to 35 which really isn’t much of an incentive. I think most of the people currently bringing in their own mug are doing it because it’s a good thing to do, not because of the discount. To truly encourage people to start doing it, the discount has to be bigger. Should you also get a discount if you bring in your own container to carry out McDonald’s burgers, or if you bring your own silverware or plates to the Outback, or if you bring your own napkins to Arby’s, or if you clean up your own table or throw your trash in the garbage bin? Or if you bring your own toilet paper with you? Seriously, Starbucks already offers a discount if you bring in your own reusable cup or travel mug? How much more should Starbucks do? Maybe the answer is to simply not provide straws at all, and either encourage people to buy reusable straws (or non-reusable straws, if that’s what the patron wants), or to bring your own “home straw”. But Starbucks should not have to nickle and dime (no pun intended) people wanting to be rewarded because those same people wanting Starbucks to be environmentally responsible. If you really want to be environmentally responsible and you don’t think Starbucks is doing what you want, either bring your own straws or cups or carry out bags or containers because YOU give a damn. Or stop going to Starbucks because they don’t reward you for doing what you want, and start going to other shops that do exactly what you want, and reward you for bringing in your own “utensils”. And maybe, to the above, I should have added, “Should Starbucks offer a discount if you pour your own coffee so as to not waste the barista’s time that could be used for other things, or give you a discount for not accepting “reward stars”, or reward you for not coming in at all and not using a disposable cup, lid, stirrers, or sugar packets”, but that would have been silly, wouldn’t it. But then, those ideas might actually appeal to some people, wouldn’t they? I love this idea. However, I have a hard time taking Starbucks seriously since atleast 50% of the time they don’t give me the 10 cent cup discount. You should remind the barista about cup discount because they’re only human. Many are new and trainers don’t always tell them or they forget. I take my plastic cup home and reuse it after washing. Dishwasher safe on top rack. I put straw and lid in silverware basket. You can take a clean cup back at most stores. Make sure to tell them it’s clean. It’s free and can be used again many times. PS charge for water cups if bigger than 8 ounces. People want large with lid and straw and that cost is passed on to everyone. Plus left half full. Some people get one drink and 4 waters. I used to see 4 oz cups with a jug of iced water on the counter. Now it’s not allowed.